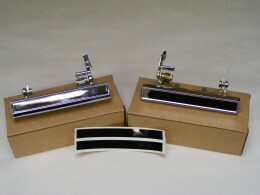 This is a pair (left and right) of new OER reproduction sill plates for all 70-81 Camaro Trans Am and Firebird models. These are the highest quality reproductions in the marketplace! After 30+ years the factory installed units look tired and abused, why not replace them with new reproduction units! They install in about 10 minutes and are one of the quickest and easiest ways to make your interior cabin come alive again! These units feature correct rivet style GM Fisher emblems, and also include new mounting screws.